There are few things that can provide a more elegant appearance than a professionally-crafted stained glass window. We are an organization of artists and professionals who have committed ourselves to providing high-quality stained glass for individuals of all income levels. Our experience and design expertise has led to orders from clients in all fifty states (USA) as well as some countries overseas. Founded in 1997 by owner and operator, Derek Schmid, the organization has become an industry-leader at providing stained glass products. Family owned and operated, the organization has been committed to serving homeowners, schools, hotels, restaurants, churches, hospitals and various other establishments requesting high-quality stained glass windows and illuminating stained glass light boxes. Streamlined Process: After 20 years of building custom one-off stained glass windows for our online based clientele, our company has emerged as an industry leader for quality, and has streamlined the process for making custom stained glass, coupled by our fast production lead times. No request for us is too big or too small: We are committed to providing services to individuals of all income levels. For over two-generations, our dedicated professionals have retained the friendly feel of a community business while utilizing pioneering technology to ensure our customers are happy and get what they order correctly, every time. Local and Global Presence: In addition to serving clients in all fifty states (USA), we have served clients across the globe. While many homeowners and small businesses have enlisted the help of our staff, we’ve also proudly completed projects for Disneyland (Anaheim), Costco, Trek Bicycles, Adidas, St. Paul’s Senior Living Facilities, US Navy, Orange Amplification, and many others. Highest Quality, Affordable Prices: While some may think that an industry leader of this type would be expensive, we offer affordable rates without compromising on the quality, which sets us apart from our competitors. We use highest-quality stained glass (USA made Spectrum Glass TM ) and a very high grade lead/tin mixture for binding, which is rich color and will last many generations to come. We ensure that we deliver you with highest quality product with rich color that will last many generations to come. Utilizing a unique computer software program, our artists designs colored glass patterns and allows customers to modify and refine them to their liking all via email correspondence. After their custom design has been established in accordance with their unique needs, our talented staff begins crafting the glass window based on these exact specifications. Combining old-world craftsmanship with the integration of new technology, our company has served as a first choice when it come to needs for stained glass windows, cabinet inserts, partitions, sky lights, doors, transoms, side lites, light boxes, and tables. Recently our studio has begun sending images of the creation process to customers, thus helping them become more involved in the adventure and furthering our reputation as a friendly, household name in the stained glass industry. When it comes to stained glass, it’s more than a simple variant of a normal window. Stained glass is a unique art form in and of itself, and we are always striving to providing the highest quality possible to customers for any type of establishment. Don’t settle for less! Let us prepare an affordable, attractive stained glass panel for you today! "OH WOW! That is all I could say when I opened up the crates. You were right, they even look better in person. They arrived last Monday, and you could never tell that they had traveled over a thousand miles to get here. They were all just like when your staff crated them." "WOW, ordered a window for a wedding gift, it was gorgeous! Rae is great to work with and window was crated and arrived in perfect condition and right on time!" 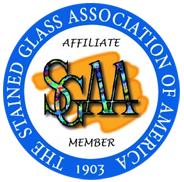 "Just received a pair of custom stained glass windows from StainedGlassWindows.com and we are SO glad we found this company!"